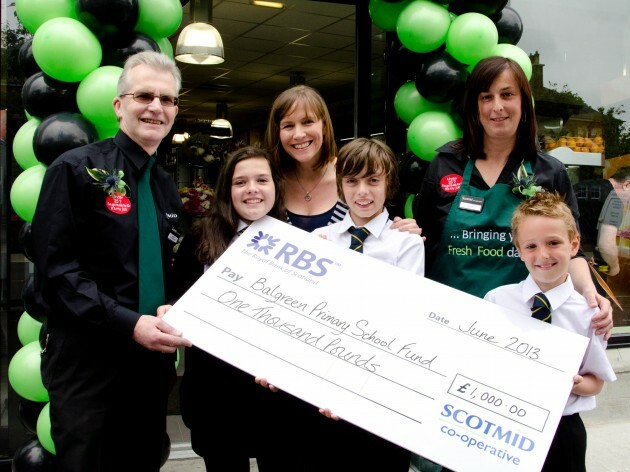 Balgreen Primary School has received a £1,000 donation from Scotmid at the re-launch of the new-look Saughtonhall store on 7 June 2013. Primary school pupils Sophie Smith (P6), Paul Smith (P6) and Kyle McPherson (P3) and Forth One breakfast radio host, Arlene Stuart, attended the official re-opening of the store, which has undergone a complete refurbishment to improve its design and facilities. Scotmid’s donation to Balgreen Primary School will be used for a technology upgrade at the school. The funds have been raised through the sale of two pence carrier bags in Scotmid stores, with 100% of the profit pledged to local charities. Customers to the new Saughtonhall Scotmid can now enjoy a new in-store bakery from Stephens the Bakers, specialty breads from The Breadwinner Bakery, a freshly squeezed orange juice maker, Costa Express (coming soon) and fresh ground coffee. The store also has a larger fresh produce section, an extensive range of craft beer and specialty wines, ‘free from’ and premium product ranges, healthy recipe cards, lunchtime meal deals and wine tasting notes. As well as the introduction of new customer services, the store’s fascia and interior has been given a makeover to improve the shopping environment for customers. Scotmid Saughtonhall is at 140-144 Saughtonhall Drive, Edinburgh EH12 5TT and is open from 7am to 11pm seven days a week.